Always Faithful speaks to women of all ages who need encouragement to notice God’s faithfulness. With all the injustices and challenges we see around us, the pressures of too much to do and not enough hours in the day to get it all done, and the silent suffering so many women endure with troubled marriages, strained relationships, financial hardships, physical illness and more, there has to be a way to begin to see God’s faithful in the midst of difficulties, as we struggle, and through the tears. Affirming the Faithfulness of God is our tagline, and that’s what we’re all about. We’ll be interviewing authors, artists, and women of faith who will not only encourage you to trust God in new ways, but also help you to see things differently, to recognize the God moments that are happening all around you, and to be inspired and lifted up to keep your eyes on the One who holds you in His hand. We’ll even interview a few men here and there, if their topic is one that would prove helpful to us as women. One thing we can promise…we’re not afraid to address tough subjects, and look for real answers to the challenges we face. We want to encourage you to live an authentic Christian life, in all honesty and humility, and appreciate the opportunity to be part of your journey. Athena Dean Holtz has been encouraging authors and communicators for the last thirty years. As a publisher, blogger, speaker, pastor’s wife and cheerleader to the Body of Christ, she shares her life, seeing God in the mundane and the marvelous, with her many Facebook friends and blog followers from all around the world. Author of three books including her latest release, Full Circle: Coming Home to the Faithfulness of God and Consumed by Success, Reaching the Top and Finding God Wasn’t There she transparently shares her life—including her flaws and failures—in order to be an encouragement to others. As the host of Always Faithful, her focus spotlights the faithfulness of God in the lives of those she interviews. You can expect to be inspired and challenged to see His faithfulness in everything. If you’d like to have Athena speak to your group, click here for more information. I almost didn’t make it to Anna Quesada’s last Christian Women’s Small Business Expo on April 18, but when I found out at the last minute that she’d saved me a table to share my info my coaching services, I changed my mind and set out to the Comfort Inn at 1604 and 281. I began setting up my table up next to my new friend, Ana Khan, who runs Doves’ Nest Assisted Living / Residential Group Home. Once everything looked good, I was ready for some divine appointments. Just before we were ready to sit down for the speaker, the rep from the local Christian talk radio station came by my table and we chatted for a bit. Toward the end of our time together I asked if there were any shows that interviewed authors (always thinking about my authors who might need to get some exposure). Her response floored me. 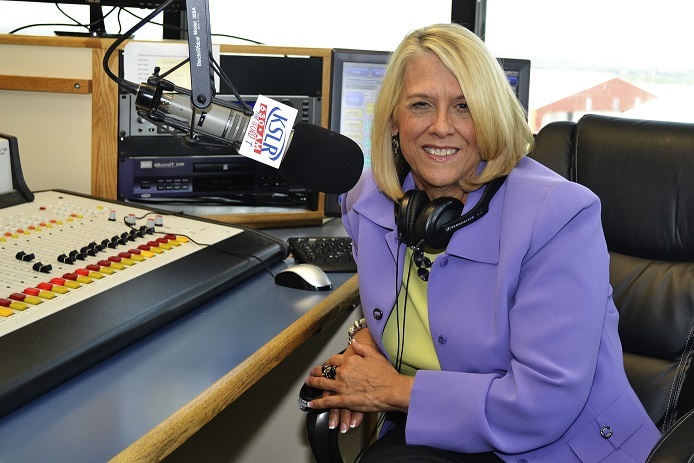 Karen responded…”Would you be interested in hosting a radio show on KSLR?” I stammered a bit and said, “Wow…let me pray about that and get back to you!” She gave me her card and I committed to follow up with her. Before I could go to God in prayer, right there at the meeting, He flashed a memory across my mind. It was only a few weeks after arriving in San Antonio, maybe mid-December. A publishing friend had encouraged me to look up Anna Marie Sheffield and her husband Jack from Christ Healing Center. I had decided to attend one of their Wednesday training classes. The day I went it was a training video from Bethel School of the Supernatural and was about the prophetic. Now mind you, I’ve seen and heard some pretty ridiculous “prophecies” over the years that not only didn’t line up with scripture, but never even came to pass, so to say that I was skeptical was an understatement. I was pleasantly surprised to hear the speaker talk about how we need to be slow to accept just any “thus sayeth the Lord” that someone speaks to us. He went on to show scriptures that encourage us to test the spirit behind the prophecy, and wait to see if the word comes to pass before giving it a stamp of approval…how just because someone says it’s a word from God doesn’t make it so. At the end of the class we got together in small groups and prayed for one another. One of the ministry staff prayed for me (not knowing anything about my media background) and said she saw a vision of me sitting behind a microphone with headphones on…she went on to say she thought the Lord was saying I was going to do something in radio. Of course, with my background in both being interviewed extensively and interviewing others over the last 25 years, the idea of doing something in talk radio totally excited me. It took everything in me to resist the urge to reconnect with all my radio friends I’ve made over the years of my career in publishing. If this was God, He would bring it to pass. I began to wonder if God was going to have me do something new. A few weeks later, at another meeting, a lady who didn’t know anything about me told me she felt like the Lord wanted me to know He was going to have me do something totally new. As I remembered these 2 incidents, I knew God was confirming that He is in this and I needed to go and set an appointment to meet with the radio station. I met with them the next morning and by the end of the conversation, Baron Wiley, the General Manager of Sales suggested I take a Saturday morning slot and do a show for women that we could then take on the road and eventually syndicate if all goes well. I was dumbfounded. Everything I’ve always wanted to do, speak to women about His goodness, on the radio and on stage, using my gifts and talents for Him, was literally falling into my lap. But this incredible opportunity did not come without an all-out assault from the evil one. I was just sure that the radio station would see the smear campaign the cult has instigated online against me. My feeble mind that always assumes the worst ran harry carry and was sure the radio station would not want to take a risk on me because of all the garbage Sound Doctrine has posted online. When I wanted with everything in me to call the station and try to do damage control, He whispered in my ear, “Just let me fight this battle…will you let me do that for you?” I surrendered again and allowed Him to take charge. It wasn’t long before a follow up appointment was set for me to go in. I went in to the station last week and did a demo tape and waited for the final green light from Salem corporate. Today I signed the contract and my first show will be live on Saturday, June 1, from 11am to Noon Central Time, on KSLR 630 AM. And yes, it will be streaming live. I’ll be interviewing 2-3 different people per show, many of which will be my author friends from all across the country. The show title is Always Faithful, and in every interview I’ll be looking for how God has proven Himself faithful to each person I visit with. I want to encourage women to trust God, because He truly IS always faithful. It just blows me away how God has orchestrated all of this. This open door came just 2 weeks after my Momma went to heaven. So many times over the last 5 months I struggled with not knowing what would be next for me…I pouted, I whined, I wept…but God would always whisper, BE STILL. Just be present in the moments I give you with your Momma, and don’t worry about tomorrow. I think back to my message to WOW, the Women of the Word, (part of the women’s ministry from the Summit EV Free Church in Enumclaw). The theme for November, 2012 was Be Still and Know Your God is Faithful. I shared how God had been faithful to draw me over and over throughout my life, and even for the 12 years I was in captivity, deceived by the enemy of my soul, He was still drawing me, until He finally drew me out in November, 2011. As God sent me to San Antonio in late November to help my brother take care of our Momma, I thought it was just a detour, a short assignment that would be over in a few months at the most. My Momma was 90, advanced Alzheimers, and on Hospice after taking a 2nd fall…I did not think it would be long before she was gone. But once God opened up a window of lucidity where I was able to share the Lord with her on my first weekend here, she made a major turnaround and started improving dramatically. Where I thought I’d just be helping my brother find a small group home like Dove’s Nest to move our Momma into, the Lord made it clear that we should keep her at home until the end, if at all possible. I thought I would only be here for a few months, but God began to whisper to my heart that this was my new home. Once I knew this was His will, I jumped in with both feet…began attending Community Bible Church, joined the CBC Choir, got my Texas Driver’s License, my voter’s registration card…took the plunge and put down roots. Even bought some cowboy boots! When I think about how lovingly, how gently He has led me…whispering to me to just TRUST HIM, BE STILL, and let HIM fight my battles, I just weep with thankfulness. As hard as it was, I just kept surrendering, I just kept allowing Him to have His way…I am SO GLAD I did. It would have been so easy for me to just be Athena…the Athena who just makes things happen on her own abilities and strength. But how glad I am that I did not allow her to take charge…but just kept putting her on the altar, allowing HIM to take control. And now, He’s given me an amazing open door to walk through…one that will enable me to have huge influence on women in this region. It excites me but at the same time, it scares me silly. May that fear keep me on my knees and surrendered to His will at all times…that I might allow Him to work through me to accomplish all that He wants. Don’t ever tell God what you won’t do! I said for 14 months that I would never return to Washington State. Well, He had other plans, He brought me back to Washington to found Redemption Press, and opened up a spot for me to move my show to 820AM KGNW, the Seattle Salem affiliate. After a few months of successful radio ministry in Seattle, and after becoming the subject of a whirlwind, amazing love story, I felt led to take a year sabbatical to focus on my new role as a pastor’s wife. After a year off to get used to being married again AND a pastor’s wife, God opened up a new door for me to walk through. Always Faithful was invited to air on AM 630 KCIS … notice anything familiar? Yep, AM 630. That’s the same place on the dial my show launched on … only now it’s Seattle instead of San Antonio. How cool is that?